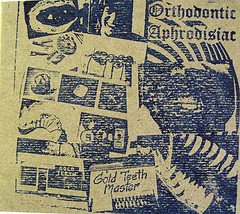 Orthodontic Aphrodesiac 'Gold Teeth Master' CD+DVD is out on Jewish Noise JN06 2008. I performed in the Schlampampen Feast - some of which is on the DVD above. We took people on a trip to outer space in our space ship.. Late people were left outside and got no alien food. You can hear me nattering away on this video.